R*E*P*E*A*T Records is proud to announce that the next of its limited edition coloured vinyl split seven inch singles is to be a distinctly pop tinged affair, starring folk-punk-pop maestro Chris T-T and Cambridge girl-boy-bangy-wangy sensations Cosy Cosy. 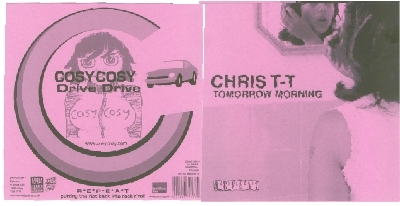 Chris T-T's 'Tomorrow Morning' was a key track on his 2003 album 'London Is Sinking', with The Guardian describing it as a tremulous, scratchy, beautifully crafted song that pauses to observe that as he faded into old age, Conan Doyle believed in fairies, before veering into grandeur and evaporating. But Chris and the band have rebuilt the song from scratch for this R.E.P.E.A.T. split single, giving it a chunk more welly and a rich psychedelic paint-job. Chris said: "Tomorrow Morning is a song about love, not a love song. It's supposed to be reality TV in the verse, then an 80s acid trip in the chorus. I think the Conan Doyle bit is the best 2 lines of lyrics I've written." These are the last full T-T Band shows of 2004, before they retreat into One Cat studio in Stamford Hill to record Chris's 5th (and final London-themed) album, due for release in Spring 2005. Sharing this see through seven inched purple delight will be new guitar pop sensations Cosy Cosy. If you thought that pop music that could make you leap around the room, sing along, smile from ear to ear and play it again and again was dead, then you need to take a listen to this.